Through his paintings, New Zealand artist John Walsh tells the stories of Aoteaora, of celestial and earthly travel, upon the seas, above the land, within the skies and also towards a mysterious translucent world between. It is a world of the ‘other’. Here through a landscape made up of delicious washes of translucent colour, the viewer is a witness to a birds eye view, sweeping into and around the valleys, skipping around the bush covered hills or sitting just above the a light tinged sea. Somehow, within his many translucent and layers of blue, green, grey, umber and white washes, we the viewer can enter the world of spirits or ancestors. It is an unspoken world, a world that links past present and future and another dimension in-between. Often Walsh’s landscapes contain human like inhabitants, a ghostly bride; her dress trailing behind her. At other times the ‘living’, call across a sea towards spirits from another world. In other of Walsh’s works, the ghosts of warriors past (soldiers from World War 1) lie in the trenches. Sometimes they are joined by tikis or ‘manaia (ancestral helpers or bringers of knowledge). Walsh’s ‘manaia’ are shown as having the head of a bird, the tail of a fish or and the body of a human or a waka. They appear to swim through a space between the land and sea. “When I started working at Te Papa, Aunty Bessie Walters from Tolaga was there. She’d been living in Wellington for years. She took me to the Maori collection and introduced me to pieces from home. She showed me a paepae board, the step onto the meeting house porch. It had this marakihau carved in shallow relief. He seemed to be swimming though time. It was stunning”. 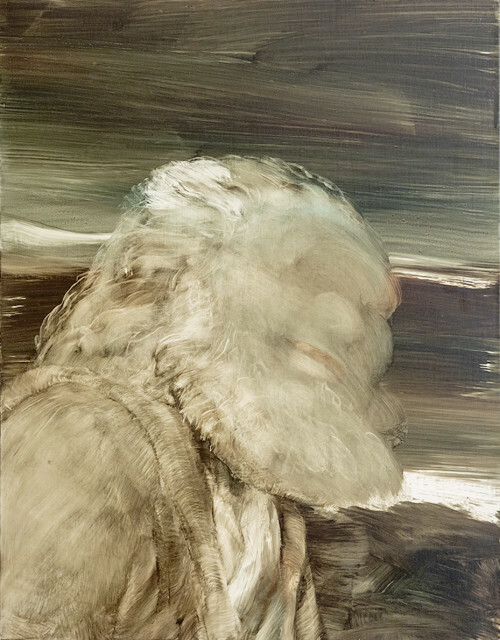 Always journerying and transversing the world between maori and his pakeha lineage, Walsh’s figures and landscapes seem to take us on a journey, that of travelling and moving forward; explorers of the past and present and future, all within his gestural lucious brushstrokes. Walsh’s paintings show why he is one of New Zeraland painters. He simply takes us somewhere we can only dream of. John Walsh was born in 1954 and his ancestry is Aitanga a Hauiti and Irish/ New Zealand descent. He was born in Hauiti, Tologa Bay, Gisborne, New Zealand. Although attending Ilam Art School in the 1970’s, Walsh is mainly self-taught. In his early career, he painted murals and portraits in the East Coat of New Zealand. He also was involved in Marae restoration (especially Te Kooti’s whare at Patutahi). In the 80’s he taught at Tairawhiti Polytechnic and then later became Tairawhiti Museum in Gisborne. A move to Wellington in 1993 saw Walsh become curator in Contemporary Maori Art at the National Gallery (which is now the Museum of New Zealand, Te Papa Tongarewa). In 2002 he left this position to dedicate himself to this painting career which was well established by this stage. Walsh has exhibited internationally and nationally for 20 years. His work is included in many permanent collections, including Te Papa Tongarewa, the James Wallace Arts Trust, the Jean-Marie Tjibaou Cultural Centre in Noumea, New Caledonia and the Sargeant Gallery. The Dowse Art Museum and Pataka Art + Museum have both held survey exhibitions of his work. Walsh has traveled to China on several artist residencies and was also involved in the Antarctica as a Creative New Zealand Antarctica Artist in Residence in 2007. In 2015 Walsh travelled alongside other New Zealand and Australian artist to Gallipoli, to produce work for the touring exhibition “Your friend the Enemy’. Walsh lives in Island Bay, Wellington, New Zealand.